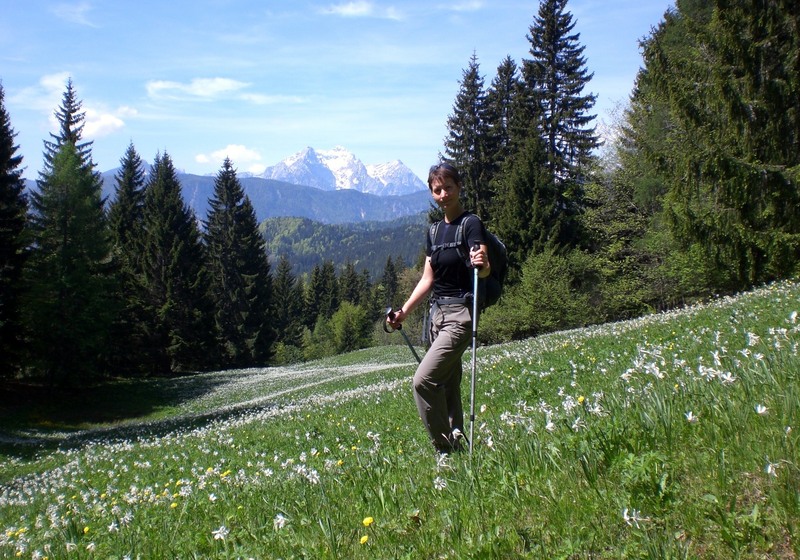 Golica is one of the most known peaks in the Karavanke range and is at its most popular during May when the daffofils which grow on its slopes are in full bloom. If I crane my neck I can just about see Golica from my bedroom window so I had been looking daily to see whether the snow would melt quickly enough to coincide with the daffodils blooming. A few weeks ago the snow was beginning to melt but then a cold snap brought rain to the valley and snow at higher altitudes, meaning Golica was once again snow-capped. Now however, thanks to the glorious temperatures of the past week, the sunny side of Golica i.e. 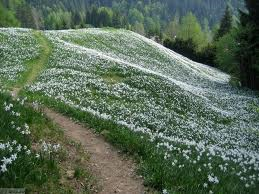 the Slovene side, is largely snow free and now is the perfect time to make the trip – be quick though, the daffodils on the lower slopes are already almost past their best, but up higher they are just coming into their peak bloom. It’s always one of my favourite times of the year as the blossoming of the daffodils is a sure sign of the end of winter and the promise of the sunnier, warmer months to come. There are a number of ways of reaching Golica. Among then, routes lead from the villages of Planina pod Golico, Javorniški rovt or from the Dom Pristava mountain hut. Always one to choose a circular route if it is possible, I usually opt for the route which leads past the Sava Caves (Savske jame) and upwards through pastures, before traversing the high ridge with stunning views of Slovenia on one side, and Austria on the other. After the final ascent to the highest point of Golica (1836m) a gully leads down to the mountain hut Koča na Golici (1582m), where drinks and traditional Slovene mountain food can be bought and enjoyed – with stunning views at no extra cost! From the hut, a path leads down through the forest, eventually returning to the start of the route. Note – there is also a more direct, steeper ‘winter’ path down through the forest which is, true to its name, steep, and involves a couple of sections of secured climbing. 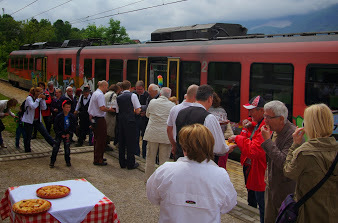 Last Sunday saw the revival of a tradition dating back 80 years, whereby visitors from far and wide come to Radovljica by train (or otherwise) to the event entitled ‘By Train to Lectar for Goulash, Ritoznojčan and Rolls’ (Z vlakom k Lectarju na golaz in ritoznojčna – kot nekoc). 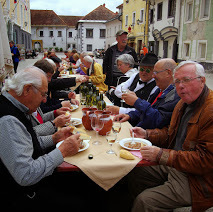 After boarding the train, complete with entertainment and schnapps upon arrival in Radovljica, visitors were escorted on the short few minute walk from the train station into the medieval town centre where they were greeted by Lectar’s ever-jovial owner, Jože, live music, gallons of cauldron-cooked goulash and the ‘Ritoznojčan’ wine – transported by old-timer bus by vintners from the Ritoznoj hills in the Štajerska region of Slovenia. 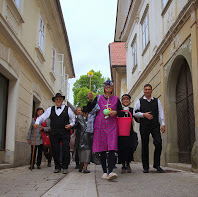 The event was a great success, well attended both by those visiting Radovljica and locals, some even went to the effort of dressing up in period clothing, and looks set to be another valuable addition to the ever expanding Radovljca Events Calendar. More photos of the event can be seen on Pinterest. This past week was also marked by a minor celebration on the achievement of my blog receiving its 20,000 reader – something which is all the more astonishing since it means that in the first 5 months of 2014, there have been as many readers as in the whole of 2013. To date, readers have come from over 90 countries. To say I’m delighted is an understatement and I hope the trend will continue. Thanks to all of you for finding and reading my blog and for all the lovely feedback and messages I have received – which help to make the effort worthwhile. Long may it continue! hello.could you please tell when is best time to visit (when the bloom is at peak)? Hello Veronika, I’m afraid it’s impossible to tell exactly. It can be from the end of April to mid-May, but it depends on how much snow there (still) is and the temperatures, so it varies each year.